Ballet companies, just like museum curators, symphonies, opera companies, put together a menu of sorts for their seasons. They offer familiar favorites, seasonal treats, and, like most contemporary chefs, try to give their diners a taste of something new, exciting and different. Shades of Sound is an interesting program. For me, Chroma is the amuse bouche that you wish you could extend into a 12 course tasting menu. This one, bite is seemingly simple but you can’t get enough of it and you want it for every course. Episodes, was a bit of a mixed composed plate for me. There were a few familiar tastes, and then some things that didn’t quite fit on my plate and left me confused. Black Cake for dessert was a naughty indulgence that was a tad too sweet and perhaps a bit dated. But, somehow I still managed to lick the plate clean and laughed right along with the audience around me. Each of the three pieces were completely new to me. I feel head over heels in love with Chroma so I’m going to start there. So far, this performance from Boston Ballet was one of the most flawless I have seen on opening night. I was invited to see Shades of Sound by the Boston Ballet and it was wonderful to see now Principal John Lam back on stage after 8 months of leave. Principal Jeffrey Cirio has an energy and dynamic that is hard to match. He is both a technician and a performer who fills the stage with his élan and connects with the audience with his personality. Part of the beauty of Chroma (and bear with me there are many parts) is seeing the men dance together as trios and duos. In a sense, there are no supporting role or corps, the fluidity of the choreography and varying roles highlights all those who step up to the plate. Like Cirio, John Lam is a beautiful dancer but his dancing also has a different kind of breath and soulfulness that is his own. Soloist Isaac Akiba holds his own both technically and expressively matching, supporting and partnering his counterparts. Boston Ballet Principals Jeffrey Cirio and John Lam in Chroma. When I go to the ballet and the program is contemporary or more abstract, I like to read as little as possible and just experience what I see before I compare notes with the choreographers intentions. Chroma is a piece that was Choreographed by Wayne McGregor for The Royal Ballet and it premiered in London at The Royal Opera House in November of 2006. What I love about Chroma is that whereas a more classical storytelling ballet is poetry in motion, Chroma is geometry in motion. There are all these plays on angles and movement in and out of space. There are connections and disconnects and a measured building of energy throughout. Unlike some contemporary pieces that play with space and movement to such a degree, Chroma told me a greater story about relationships and connections. Boston Ballet Principals Paulo Arrais and Whitney Jensen in Chroma. Whitney Jenson is exquisite and Paulo Arrais seamlessly moves in and out of extremely difficult partnering with grace and precision. The pair create stunning forms together defying gravity and walking through the space time continuum as if just strolling casually through Boston Common. In fact Chroma has moments of stillness and walking that enhance the piece just as much as some of the sophisticated partnering. The contrast of still, standing figures and a joyful chaos of motion is a nice reflection on our lives in general. Chroma seems to progress from geometry in motion to something a bit more animal like then slowly becoming human. The lines and shapes come alive. Principal Kathleen Breen Combes and Soloist Bradley Schlagheck are a beautiful partnership. The lifts are almost elastic with Breen Combes unfurling and exploding across the stage supported and then recoiling back to Schlagheck again. Principals Kathleen Breen Combes and Bradley Schlagheck begin Chroma entangled. Principal Lia Cirio has an incredible ability to transform herself into a completely different dancer in each piece she performs. 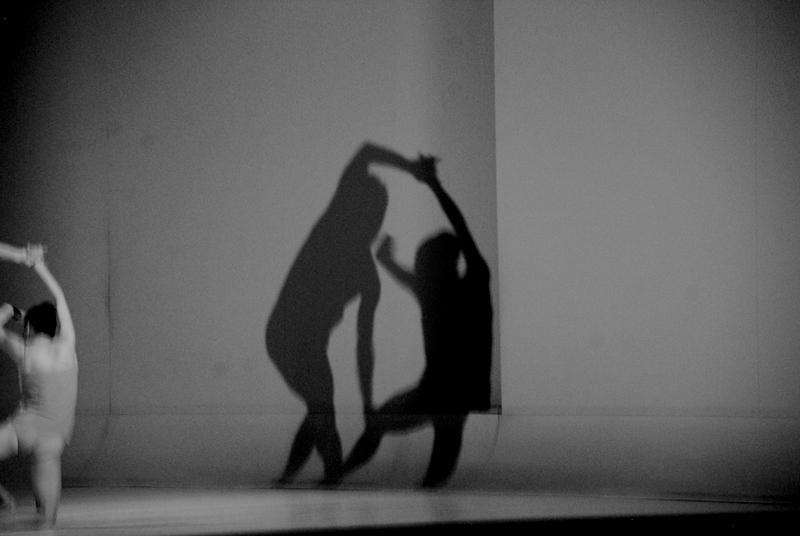 This duet between Cirio and Lasha Khozashvili takes Chroma from shapes to living beings and emotion begins to be evoked. Lia Cirio and Lasha Khozashvili’s dancing washes over you and drags you into the emotional part of the dance from the very first movement they perform. As Chroma progresses relationships seem to form and the space is filled with shifting duos and trios interacting. Chroma concludes with a sense of community the entire cast moving together going beyond just simple connecting and disconnecting. This human connection is added in and then the curtain drops. Chroma was met with a huge standing ovation and it is a piece that I will count down the days until I see again. The simple, clean set and costumes become more than what they first seem: a white square cut out on stage (or is it a black square present on stage) and squares of not much more than white cloth on the dancers. The set and shades of the costumes change dynamics, color and intensity throughout the piece just as much as the movement itself. Just like some of the most memorable dishes I have tasted, I will crave Chroma for all that it had to offer. Chroma dancers: (front left) Principals Paulo Arrais & Misa Kuranaga, (hidden in the back), Soloist Isaac Akiba & Principal John Lam, (back) Principals Whitney Jensen & Lasha Khozashvili, (front middle) Principals Jeffrey Cirio & Kathleen Breen Combes, (front right) Principal Lia Cirio and Soloist Bradley Schalgheck. Shades of Sound opened at the Boston Opera House on Thursday March, 19th and will run through Sunday, March 29th. Special performances include a Pre-Curtain Talk on Saturday, March 21st prior to the 7:30 performance and a Post-Performance chat with Mikko Nissinen on Thursday, March 26th after the 7:30 performance. Tickets start at $29. For more information, visit www.bostonballet.org or call 617-695-6955. For special seat upgrades, preview video clips and other treats visit Boston Ballet on Facebook.